One of the first underground bands I remember seeing -- definitely the first I ever wrote about -- was a sci-fi horror punk band called Mazinga, playing a basement show in Ann Arbor, Mich., in the late 1990s. From the basic foundation of Ramones, Misfits and Stooges, Mazinga extended into surf and psychobilly, along the way providing a cathartic release for adolescent nowheresville angst through songs about intergalactic weapons and demonic women, evil overlords and the underworld. Popping in the Serpenteens' Dead Men Walking was an instant ticket back to those days, and equally visceral, out-there and just plain fun. By sheer coincidence, both Mazinga's and Serpenteens' CDs have a song titled "Satana." But what's not coincidental about Dead Men Walking is the flashback quality: Many of its songs made their way through the tape traders as demos in the mid-'90s, and have just now been rerecorded by Serpenteens for their full-length. "I get e-mails and letters still from people who are like, 'I listened to your demos all through high school, and now I have my own band that plays horror rock,'" says George Grant, a.k.a. Alphamayle, Serpenteens' vocalist and founder. "We started doing it so long ago, we're almost considered high on the food chain as this thing is coming around again." Grant, a Wilkinsburg native, is talking with me via phone from New York City, where he's working a long day on a crew that's shooting a commercial. Though he's dog-tired -- a late Serpenteens gig the night before, and another to play after the shoot -- he's happy to discuss horror rock, a punk sub-genre that started in earnest with the Misfits, but which he suggests actually stretches back to Screamin' Jay Hawkins. He's also happy to explain why, 10 years after Serpenteens' unholy conception, the group is now hitting the road and signed to Blood and Guts Records. "We never really had the musicians when we started this, proficient musicians, great musicians who really got it," he reflects. "They were just guys who wanted to play Kiss covers all day long. Which really wasn't what we were about." Serpenteens began with Grant and fellow zombie- and horror-fan Mark Zap, a.k.a. "Bub" Romero, as a one-off "monsterpop" side project while the two worked in their own more serious bands. But those priorities eventually fell by the wayside, and the side project became the real deal, especially with the recent additions of axeman Frank Morin (Frank N. Stein) and drummer Glenn "The Creature" Sorino. For Dead Men Walking, Serpenteens rounded out songs from their decade-old repertoire with new material. While Grant's ghoulish baritone remains a constant, the material covers quite a range: from Ramones-esque ("X-Ray Eyes!") to Osbourne-esque ("Speak His Name"), from the creepy country of "Hell California" to the faux doo-wop of "(Please Be My) Zombie Bride." Two decades ago, Grant was an active member of Pittsburgh's rock scene, before moving to New York to seek his musical fortune. 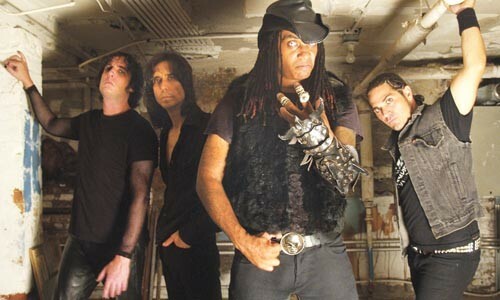 Here, he claims a couple of the scene's firsts: First Speed Metal Band (Necropolis) and First Death Metal Band (Bird of Prey). He has two children ("grown now, almost") in Pittsburgh, and stays in touch with some buddies from back in the day, like Spahr Schmitt from Hi-Watt Hex, with whom Serpenteens will be performing at their Pittsburgh gig. But make no mistake: he's still an evil space creature -- and one who's pumped for horror rock's future. "It's really picking up in London," he notes. "There's a band, they're really more death-rock than horror rock, but they're called The Terrors, and they're young guys, between the ages of 16 and 20," he says. "A lot of our newer fans now are from the U.K. and Germany." While he'll speculate that the many recent horror films may be responsible for the resurgence of interest in the horror scene, Grant is reluctant to over-analyze why people enjoy the music and the image. "I think some people just like gore!" he exclaims. "I'm a huge zombie-movie fan, of course, I was raised in Pittsburgh, 15 minutes from Monroeville Mall. Some kids grow up wearing Godzilla shirts, and some kids don't."